BPM-110 Automatic Blood Pressure Monitor makes it easy to check blood pressure at home . The Easy fit Cuff is pre-formed for a quick and proper fit that is perfect for arms 9 to 13 inches. It’s easy to apply the cuff to your arm without any assistance — simply wrap the cuff around your arm and press start. In seconds your blood pressure and pulse are displayed on the large digital panel. 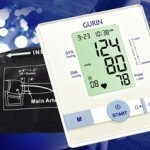 BPM-110 Automatic Blood Pressure Monitor ensures accurate and comfortable readings. And with a 60-memory recall, you can track your blood pressure and pulse progress as your work towards a healthier lifestyle. SPECIFICATIONS: Blood Pressure: 30-280mmHg, Pulse Rate: 30 – 199 beats/min, Blood Pressure Accuracy: +/- 3mmHg, Pulse Rate accuracy: +/- 4%, Operating Temperature: 10’ C to 40’ C, Operating Humidity: 15% to 85% RH (non condensing), Storage Temperature: -20’ C to 50’C Storage humidity: 15% to 85%RH (non condensing), Power Supply: 4 x 1.5V AA Size alkaline batteries, Cuff circumference: Approx 9 to 13 inches, Memory: 60 sets with WHO indicator, 100% Satisfaction Guaranteed.